Belize Rural South (BRS) voters converged at the polls on Sunday June 12th to place their vote to elect the PUP standard Bearer for the upcoming 2013 elections. 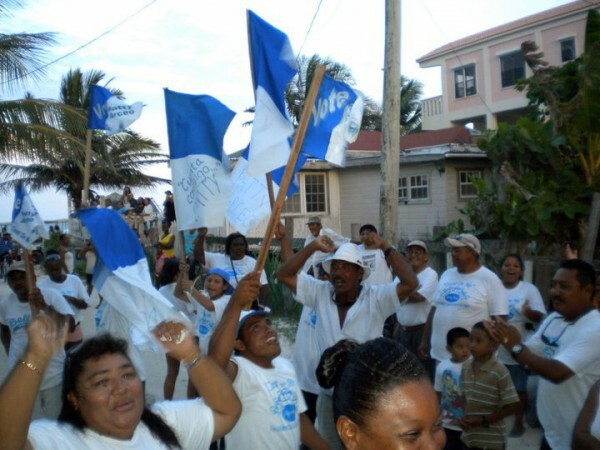 Contesting for the right to represent BRS's electorate were Ana Patricia Arceo, Mr. Baldemar Graniel and Mr. Ramon Reyes Jr. of Caye Caulker. With the voting commencing around 9:00am and lasting through to 5:00pm, 1406 individuals came out to cast their votes. At the end of the counting, the results placed Ana Patricia Arceo, also known as Patty, at the top of the poll with 950 votes, naming her 2013's PUP Standard Bearer for BRS. She was followed by Ramon Reyes Jr. who garnered 258 and Baldemar Graniel, who captured 187 votes. From all the votes casted, eleven ballots were spoiled. Patty's victory stretched across both islands. In the Caye Caulker ballot box, she received an overwhelming 289 votes while Ramon Reyes Jr. received 89 votes. Chairman for the PUP, Mr. Henry Charles Usher was issued the official announcement of the votes, and thanked all that came out to cast their votes. "As a proven fighter I want to share a Spanish proverb which expresses my belief; 'quien no mira hacia adelante; atrás se quedara', saying 'he who does not look forward to the future, remains in our past.' It is with resolute courage and with the help of God together we shall tackle each issue and we shall rescue our islands." After the formalities, the crowd of over 500 celebrants marched through the streets of San Pedro.